interprets this motion as sound. The amplitude of the waves corresponds to the volume level we hear and the frequency decides the nature of sound. magnet. The permanent magnet is fixed and the electromagnet is a coil of metal wire like copper or aluminum, fixed to the diaphragm. When an electric current is sent through the electromagnet, it is either attracted to or repelled away from the permanent magnet. The polarity of the coil can be reversed depending on the current. 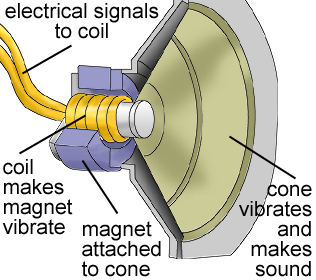 This back and forth movement causes the diaphragm or cone to vibrate, because it is connected to the magnetic coil. This is the sound that we hear.